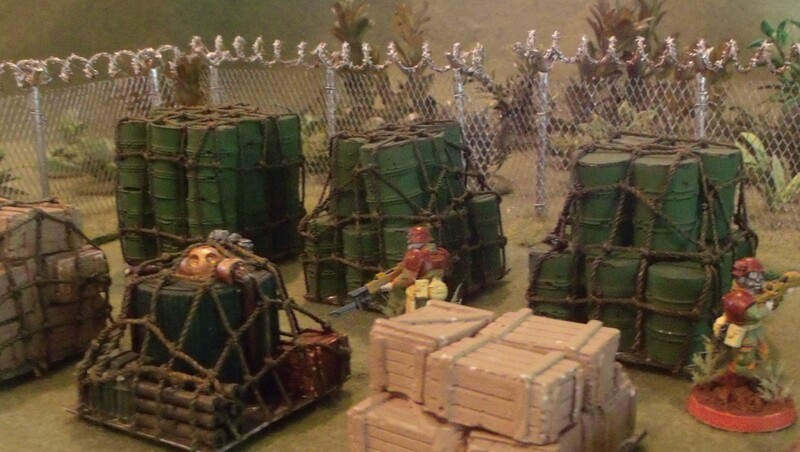 Single supply pallets make really good objectives all by themselves, but when used in mass they can make for very interesting terrain to play games on. The pallet itself is literally just a pile of stuff so you can make a convincing one out of almost any bits that you have laying around. Adding a simple cargo net over the top of a pallet of nothing but boxes dramatically improves its look. Start by selecting some string to make your cargo net out of. In this case some heavy duty nylon thread was used, but almost any suitably sized string should work. Next you will need to make a loom to help you make the net. All you need is a piece of cardboard with some lines drawn on it and a few notches cut into it. The size of the square in the center should be whatever the size of your pallet is that you want to cover. My pallets were 2” X 2” so that is the size of my square in the center in this example. I used a 2” margin all around the square because that is the height that I was planning on stacking stuff on the pallets. My ropes will be ½” apart so I have drawn a grid with lines ½” apart. The lines will be used as references to keep the net straight when tying the knots. I cut a small notch in the edge wherever a reference line was to help hold the strings, but you can just use tape to secure the string if you wish. Next “load” all of the vertical lines with string by tying a knot in the end and wrapping the loom going from notch to notch. The tighter you make these initial vertical lines the easier it will be to tie the horizontal ones later. To do the horizontal lines start with a string that is at least twice as long as the loom is wide (to give you enough extra string to be able to tie the knots). Then start tying your knots using a simple overhand knot. If you have trouble with the knots slipping (a big problem when using nylon thread) then simply glue each knot in place with a small amount of super glue. Once all of the strings are in place cut the strings on the back side and take it off of the loom. After placing the woven grid over the top of the pallet secure the side “fringe strings” down to the bottom of the pallet. Now work your way around the pallet connecting all of the vertical “fringe strings” with a new horizontal one. It’s a very simple process, but it is rather labor intensive.